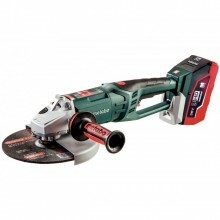 The Metabo 36V 9" Cordless Angle Grinder Kit (613101640) is a powerful angle grinder engineered for the highest level of performance while ensuring operator safety. This is the largest cordless angle grinder available on the market with a wide range of uses and an extremely high cutting dept of 3". The main handle swivels and the side handle can be mounted in three different positions for maximum safety and comfort during operation. Additionally, the side handle features VibraTech technology for vibration dampening, reducing stress to the operator's arms. The encapsulated brushless motor features restart and over load protection along with electronic soft start for a smooth start up. This kit includes two LiHD battery packs (6.2 Ah) that provide minimal temperature generation and feature an extremely long service life. High cutting depth of 3"
Click the button below to add the Metabo 613101640 36V 9" Cordless Angle Grinder Kit (WPB 36 LTX BL 230) to your wish list.